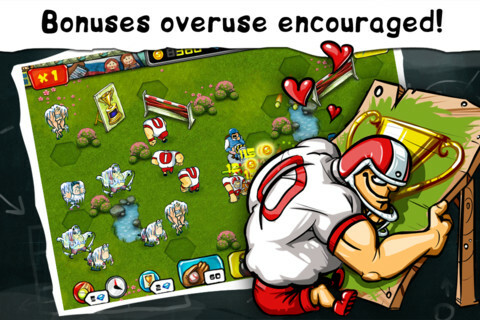 Apps4Review.com | Goal Defense – Take that ‘Wierdy’ Down, Buddy ! Good: great concept and animations, humorous characterization, entertaining. 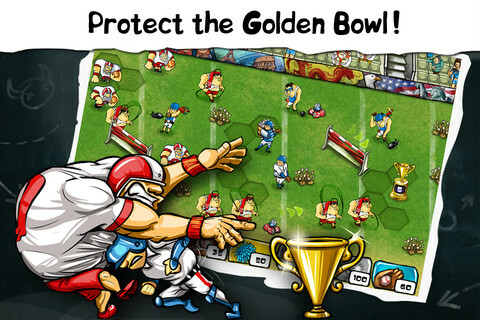 Bad: There are so many elements that in higher levels, it becomes almost impossible to protect your Golden Bowl. Imagine a situation where you are sitting in a stadium watching the title match of baseball and suddenly some male- rope skippers come inside the ground. The skippers are fat and running towards the championship trophy. Yes, you are shocked but then the worse happens. To save their trophy for which they have fought so far in the tournament, the players start knocking them one by one with powerful shots. Sounds weird? It is, but that’s what we have in this new mind-puzzling app called, Goal Defense. Goal Defense is an iOS app that has been released recently in the App Store. It has been developed by Dynamic Pixels. 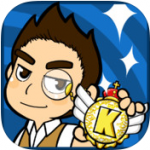 The app is compatible with iPhone, iPod touch and iPad and requires iOS 3.1.3 or later version. 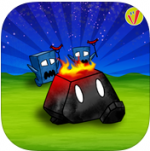 The app is a tower defense based game but is entirely different in many areas. Your main aim is to protect the golden bowl. You have a team of baseball players with pitchers and batters. 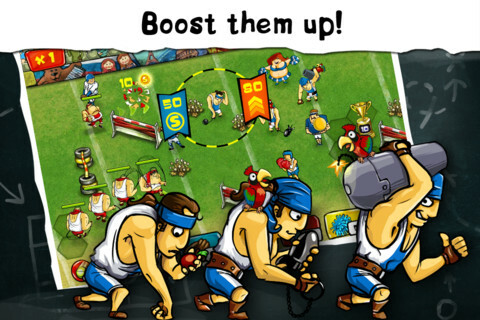 As the game starts, you have to position them in such a way that will slow down the movement of enemies as well as give you ample amount of right opportunities to attack them. There are 40 difficult levels requiring tactical approach and speed. The starting oppositions are good enough to ignore. But as it turns brutal, it will be quite rare for you to leave the field alive! There are a lot of hurdles on the field that you must use to your advantage through proper field placement. Your defense is reinforced with some special players that keep on adding as the game progresses. For example, the cheerleaders are there to distract your opponents from their goal (and you know how they do it). Also, your players can be upgraded to new strengths after you have enough points on the board. That is when your X-ray boxer with a hard-punching power turns ‘Thor’, and takes power from the almighty lightning Gods to show your rival the way of death. Whether it’s the animations or the all around humor content, the game is always entertaining. It might look to be an easy bet at the starting looking at the cartoon themed characters and enemies that sound more alien than ‘Mr. Bean’, but soon their army will outplay your team like torn toys. The field is filled up with so many elements that it will be hard for you to concentrate on the right place. Adding to it, there are power-ups that will help you to distract your enemy and get more time to fight them back. You will earn points in the form of crystals depending upon your effectiveness, no. of wins and other factors. The app is priced at $0.99 which is the biggest ‘positive-shock’ in the story yet. There are also many in-app purchases available for the power crystals. Looking at the features, the game is expected to gear up a huge audience on its shoes. We really enjoyed playing this game and are happy to recommend you with an ‘empty-minded innocent smile’.